This past Thursday was my first day without teaching a yoga class, or classes in 10 days! The cold or whatever I’d had was finally on the way out, it took forever. I really missed swimming, but I made it two days this past week and I didn’t feel like I’d fallen too far behind. The weather has been absolutely amazing and Thursday did not disappoint. I headed out into the yard by 9:00 a.m. and loved every minute of it. My flower garden on the north side was a disaster of debris. I ended up using the lawn tractor and trailer most of the day and hauled off 12 loads down back. I also chucked the 16 milk crates of walnuts that I didn’t get a chance to sell. Bummer on that deal. 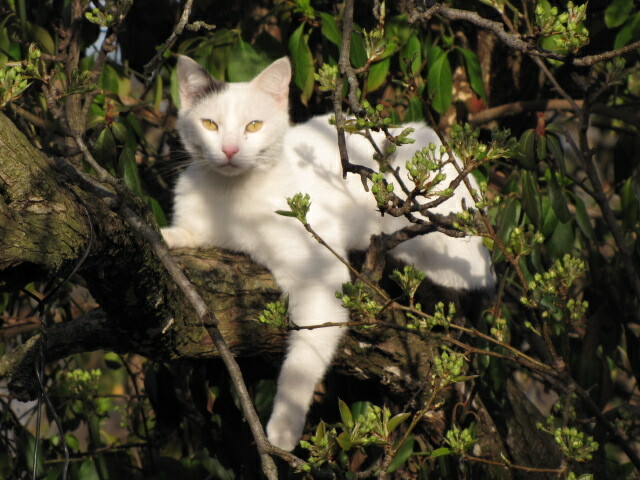 Jackson, the white cat, is loving this weather as well. He was outside with me all day and spent a great deal of his time lounging in the pear tree. 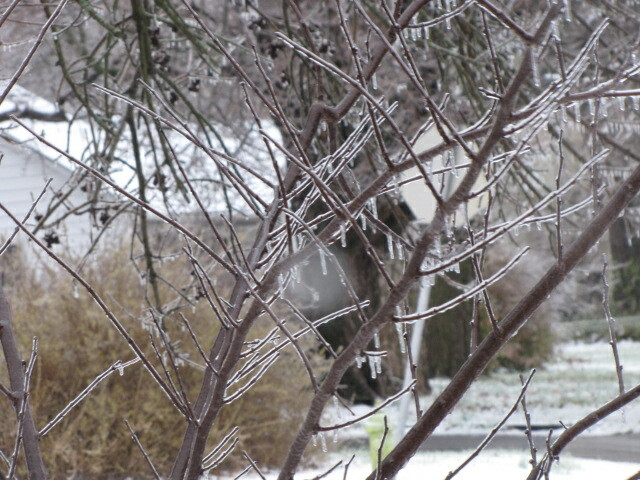 That pear tree needs to come down, most of it is dead, but here’s why we can’t cut it down just yet. 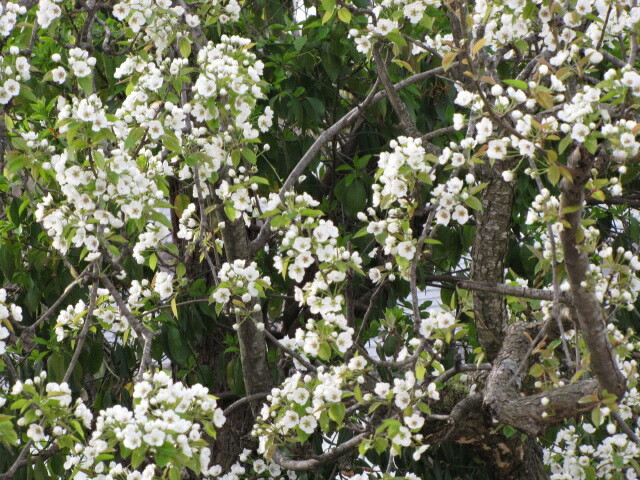 Half of it still blooms and produces pears. It also smells so good and it’s so pretty. The pears are small and not really that edible. The squirrels usually destroy them before they get a chance to do anything. 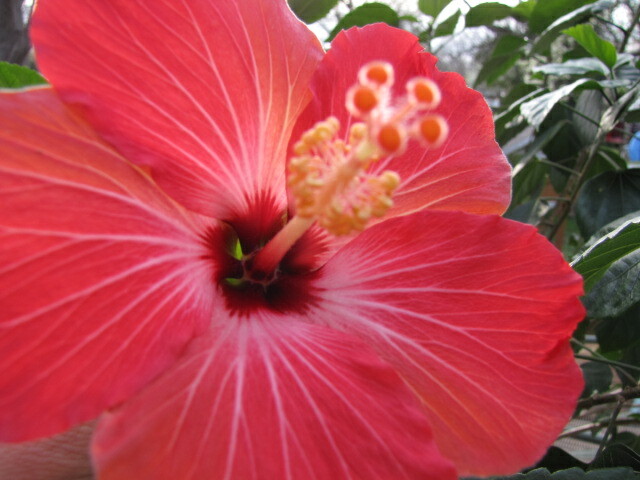 My hibiscus tree also popped one flower open yesterday! I think it really enjoyed that steady rain that we received all day on Friday. I liked the rain as well. Nothing like a rainy, chill out kind of day after you’ve spent 10 hours in the yard. The visit with my family went great. My parents showed up with a ton of grapefruits as they always do. Mom even attended 3 of my yoga classes and we gave a bunch of grapefruits and jars of calomundin marmalade (that she’d made) away. She also brought me 5 gallons of calomundins. That took us a couple of hours to process. There were four of us working. First you have to cut them in half and remove the seeds. Then after you’ve done that, you can squish them through a collander to juice them. But we used my juice extractor instead. We made a calomundin pie before they left to see how it turned out. It tasted the same, but the filling was a deep orange instead of yellow and it didn’t have that glistening sheen. But hey, we’re not making it for a a contest on food network so it’s all good. Plus it saved a LOT of time! I’ve had the windows open all day and the air has never smelled so good. 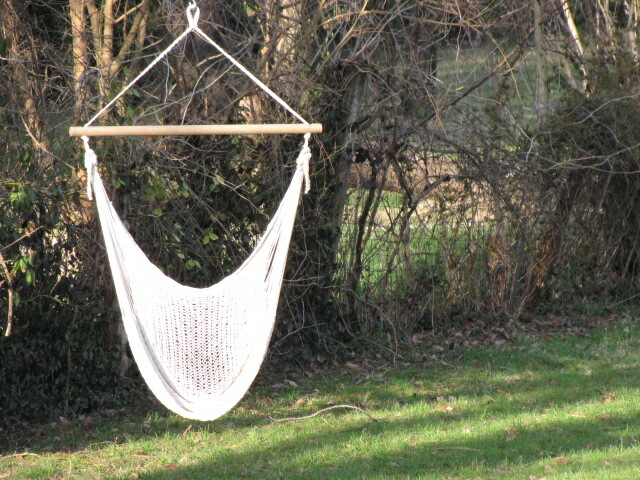 I plan to spend some quality time in my swing this week. Life is good. Enjoy. 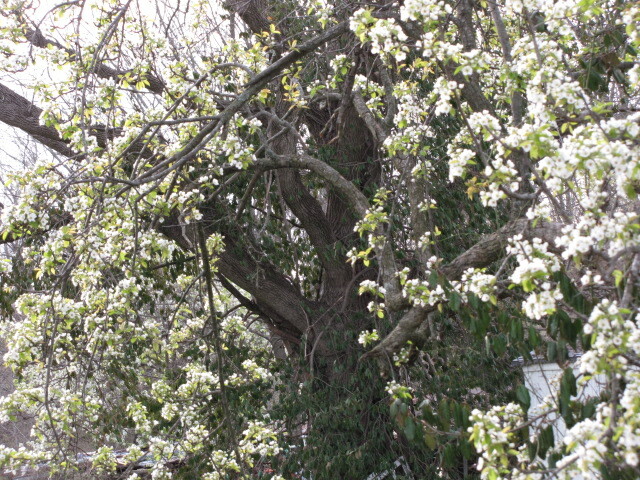 Categories: family | Tags: calomundin, grapefruit, hibiscus, pear, spring, tree | Permalink. This will be the third year we’ve planted a garden. Not a flower garden, but a food garden. I have a few flower gardens. The one pictured at left is from the year before last. 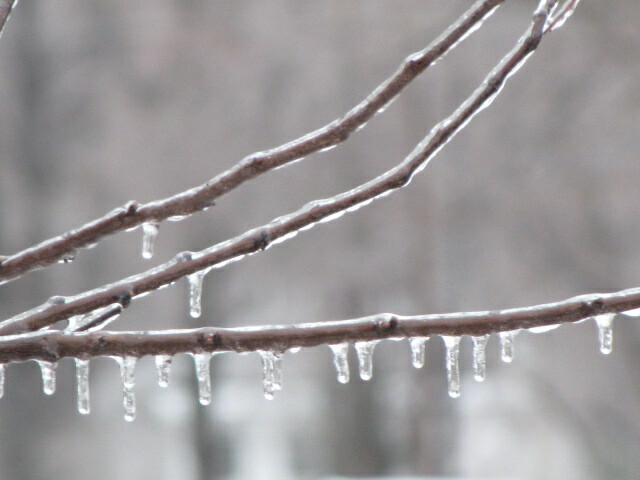 My blog header, is actually one of my gardens as well. This garden is on the north side of our house and it’s in the shade. That called for lots of hostas, perennial begonias, ferns, lilies and impatiens. I can do flowers, I can. The veggie thing is somewhat new to me! The first year we planted a food garden, the squirrels literally ate everything. I mean all of it. We have lots of walnut trees, so we have lots of squirrels. They ate the tops off of the sweet potatoes, they ate the green tomatoes, they destroyed the garden. Last year we planted peppers between each tomato plant and guess what? We got maters, that’s what! So tip number one. Plant peppers, any peppers between each tomato plant to deter any critters. This would’ve been nice to know, especially after I spent god knows what on different repellents! We also have several mature trees in our yard which I adore, so this makes some serious shade near our garden. I found by trial and error that leafy greens do really well in partial shade. Corn on the other hand, sucked. It needs sun!! But we harvested some micro-corn last year and it was tasty, but small. So this afternoon I planted 10 hybrid tomato plants, 10 asparagus crowns (that’s a new one for us), a bunch of yellow, sweet onions, snap peas (yum), some arugula and a row of broccoli. The strawberries from last year have taken up another row and that’s a good thing. I will have a hybrid of Jewel and Whopper strawberries this year! Tip number two. Buy some cheap netting and cover them up because the birds will eat them before you get out of bed in the morning! Tip number three. A good friend told me to get a couple of tires and stack them. Fill them with mulch and plant potatoes in them, instant potato garden. I have not tried this yet, but we intend to. We can put the tires in any sunny spot in the yard this way! Tomorrow I buy the pepper plants and get them in the ground. Hopefully. Our weather has been pretty much hit and miss for any yard work here lately, that’s for sure! How does your garden grow? Categories: gardens | Tags: flowers, garden, gardening, potato, spring, squirrels, tomatoes, vegetables | Permalink. Sunday, March 22 from 3:00-5:30 p.m.
Join us as we welcome Spring with live drumming, chanting and 108 Sun Salutations! You do not have to do all 108 sun salutations. Come meditate, chant and meet like-minded people all for a good cause! We realize this is Spring Break for lots of folks, but if you’re staying in town, enjoying the economic crunch locally, please join us on the 22nd floor, 270 feet up! Enjoy the skyline, welcome Spring, renew your commitment to yoga and to your own wellness. Event is free, with a suggested donation of $15, but please give what you can, we know times are tough! All collections will go to the Alzheimers Chapter of Southwest Missouri. Categories: Yoga | Tags: 108, charity, donation, drumming, equinox, event, mala, march, meditation, missouri, mo, salutes, sanskrit, spring, springfield, sun, Yoga | Permalink. *Updated the appearance of this blog, used my own garden photo. Perhaps I’ll start up a website with header photos that I’ve taken. Do I need another business? *Sister update. The job offer never happened. Just from that lack of communication, I told her that she most likely does not want to work there anyways. Easy for me to say as I’m not the one without a job. Her mortgage modification has not gone through yet, so this is looking bleak. I hate it. *Getting ready to break from MSU yoga! Nice to have a bit more free time. To do what? Clean my house. *Our son will turn 16 on March 8. He purchased his first vehicle, a 1987 Dodge Dakota. It’s a real lemon. My husband can rebuild and loves any small engine repair. He’s never overhauled a vehicle before. But guess what? He has now! In our backyard he self taught himself how to change bearings and an oil pump in a vehicle engine. In the cold weather at that. *I wish my kitchen was a small engine. *When you own a truck, everyone wants your help. When you can fix stuff, everyone wants your help. *It’s sunny today and I am really glad. Tomorrow it’s supposed to be in the 70’s. *I have an infection of some sort on my eyelids. Make-up, bacteria, viral or an allergy? I don’t know. It’s been a week and it’s not all the way gone. I’m thinking about checking out the new walk-in clinic at Wal-Mart. They take our insurance. Now if they just had a post office! *We sold our ugly loveseat on Craig’s List for $30 in less than 24 hours. *We also got rid of our ginormous blue, velour sectional. *We inherited a sofa (below) that my sister purchased from Burdine’s. It will be slipcovered soon as we cannot have anything that light of a color in our house! We also inherited a barrel chair from the house I grew up in, a cool white end table from Pottery Barn and a leather ottoman/coffee table. *On the way to Pier 1 to check out a $375 chair, I stopped at a flea market and found two chairs for $129. Totally awesome. I’m not into antiques, but I think they’re from the 30’s or 40’s and man, are they comfortable! They do look cool and they’re in great condition. *The round glass coffee table is a split tree trunk and my sister made it. I’m keeping it, but taking it apart and using the trunks for extra seating or something. We’ve had it a long time and it went great with our sectional. *Anyone need a huge piece of super heavy, circular glass? *Ignore the floor as it will be refinished and of course, doesn’t everyone keep sheet rock in their hallway! We’ve been consumed by a 1987 Dodge Dakota! *I’m painting the frontroom and hallway blue. *You can park for 30 minutes at MSU for a quarter! Perfect for dropping off paper work. Beats an $18 ticket! *Things that are marked “Dresden” and “Nippon” are great items to put on e-bay! *I am so ready for the grass to turn green! Categories: news | Tags: 1987, allergies, antique, chairs, dakota, decor, dodge, ebay, furniture, paint, spring | Permalink.